These wholesale Mudra Crafts thumb screws are comfortable and easy to use. With the precise length, thread, and girth, this collection of hard-to-find bolts should be almost universal and can be used for computer hardware and peripheral installation such as case covers, power supplies, PCI slots, motherboards, or even hard drives for certain models. The thumb turning knob design with the screwdriver slots on top make opening a computer case a breeze. It offers easy access to the internal parts of your computer. The sharp design makes it not only functional but also eye appealing for your computer or gaming rigs. You can finally handle the situation calmly when you receive equipment with missing or damaged screws or misplace or lose a screw during parts installation, assembly, or the repair process. 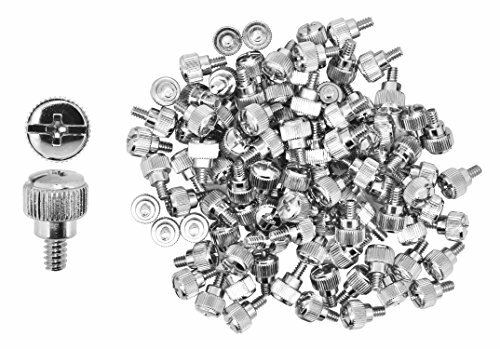 Whether you are a PC building hobbyist or a professional tech, this set of replacement screw accessories is a necessity and the quantity should last for several projects. Compatible with the following models, which are trademarksTM or registered® trademarks of their respective holders. Mudra Crafts's use of these marks does not imply any affiliation with, association with or endorsement by these trademark holders. Mudra Crafts ® is USPTO registered brand solely owned by Mandala Crafts. Located in Austin, TX, we have been making quality products since 2001. We take pride in our business and offer a 45-day no questions asked warranty.